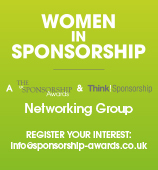 The UK Sponsorship Awards celebrate the very best in the UK and international sponsorship industry. By becoming a category sponsor category, we can take your brand and put it before all the major decision-makers in the sector – whether they be sponsors, rights holders or suppliers to the industry. Your company name becomes intrinsically associated with the prestigious Awards and to the event itself. Logos and links will appear on all marketing material leading up to the event and at the event itself – on call to action material, on the Sponsorship Awards website, the Hollis Sponsorship Bulletin, regular email updates, and at various points during the Awards ceremony. You will also have access to the guest list post event.